Bringing his eye for innovation, appetite for adventure and more than a decade of restaurant industry experience, Nick Scott serves as Owner/Executive Chef at Alchemy Restaurant & Craft Cocktail Bar and Owner at Interim Restaurant and Bar in Memphis, Tennessee. A Tennessee native, Scott moved to Memphis in 1997 and soon became an active part of the local culinary scene. Prior to Purchasing Alchemy in April 2016, he held the position of Executive Chef at Flight Restaurant and Wine Bar. He also served as chef-partner at Fleming’s Prime Steakhouse & Wine Bar and executive chef at Bluefin Edge Cuisine & Sushi Lounge. During his tenure at Bluefin, the restaurant was awarded “Best Japanese” and “Best Sushi” by Memphis Flyer and Memphis magazine. Scott also honed his international culinary skills at Memphis’ Do Sushi Lounge, Stella Restaurant and Wally Joe Restaurant. Scott’s passion for the restaurant industry began while working as a dish washer at the age of 15. From there, he continued building his cooking repertoire, even traveling to Japan, where he developed his affinity for global cuisine. 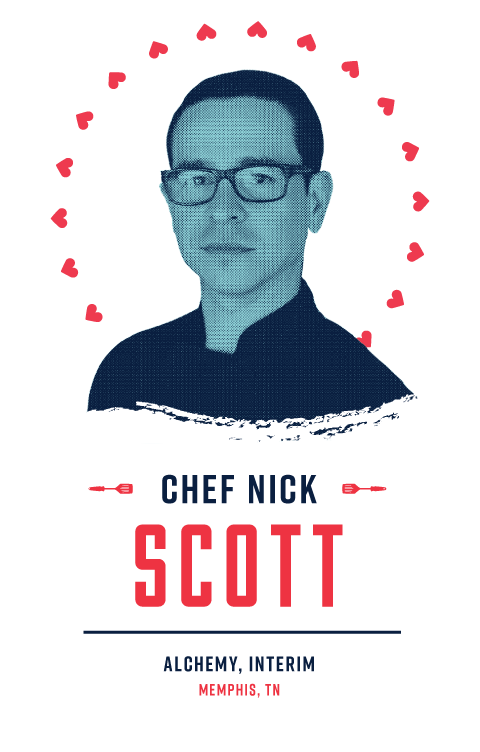 Driven by creativity and industry trends, Scott aims to deliver a unique culinary experience with each dish he creates.